A few of the things that set Regency Retirement Village of Jackson apart from other communities are our nursing staff, the uniqueness of our dining experience and the way we use social media to keep the family of residents involved in what we’re doing. “We offer around-the-clock nursing so someone is always here if you need them,” said Mickey Goodwin, Executive Director of Regency Retirement Village of Jackson. Regency Jackson also uses social media to improve connections and communication. With the fast pace of modern life, platforms like Facebook enable people to stay aware of what’s happening with their friends and family, even when they can’t always be near in person. It’s reassuring for families to see that their loved ones have plenty of opportunities to be active and social. “Our Facebook Profile is updated on a daily basis. It’s a great way for families and friends to share all of the wonderful memories being created at Regency,” Goodwin said. 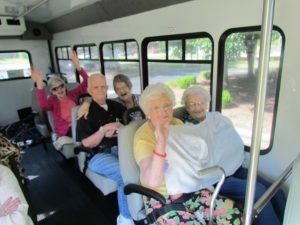 The Facebook wall, https://www.facebook.com/Regency-Retirement-Jackson-176921574978/, is populated by photos of residents having fun, whether they’re gathering to play Bingo, having a sunflower social, visiting with animals, enjoying art class, having a scavenger hunt, celebrating someone’s birthday, doing Zumba chair fitness, enjoying Bible study, or shopping. The families of residents obviously love seeing photos of their loved ones in their Facebook news stream because they often leave comments about how they look like they’re having fun. That translates into peace-of-mind that they’ve made a good choice for quality and compassionate care. Regency Jackson strives to be a place where residents can come together for a delicious meal, great conversation, laughter, and most of all, lots of love.